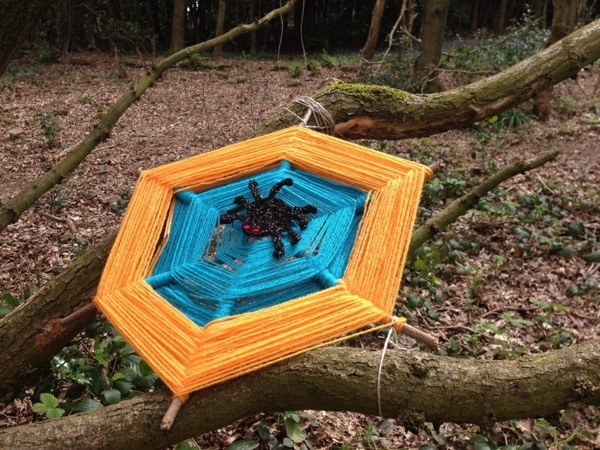 The Woollen Woods are once again planned to come to the Parks Wood in Belper during May 2018. Lots of individuals and groups have already expressed interest in being part of the event. There are no set patterns and it is perfectly acceptable to make one item or to take on a whole tree. At the moment I am enjoying myself making woodland birds to install in the wood. It is important to me that anyone who would like to be part of the event feels confident that they can do this. 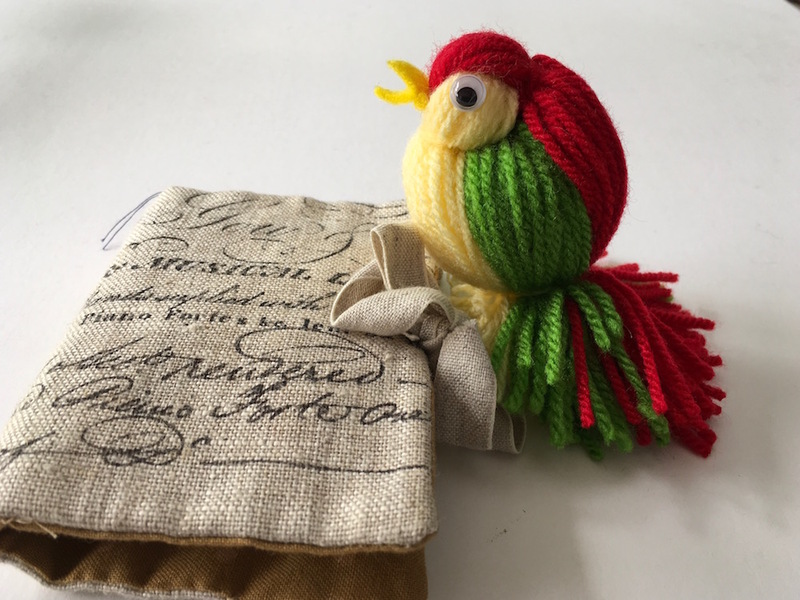 There are lots of free patterns available on the internet but on this blog I am sharing some simple ideas that still look really good, especially when things are grouped together in a tree. 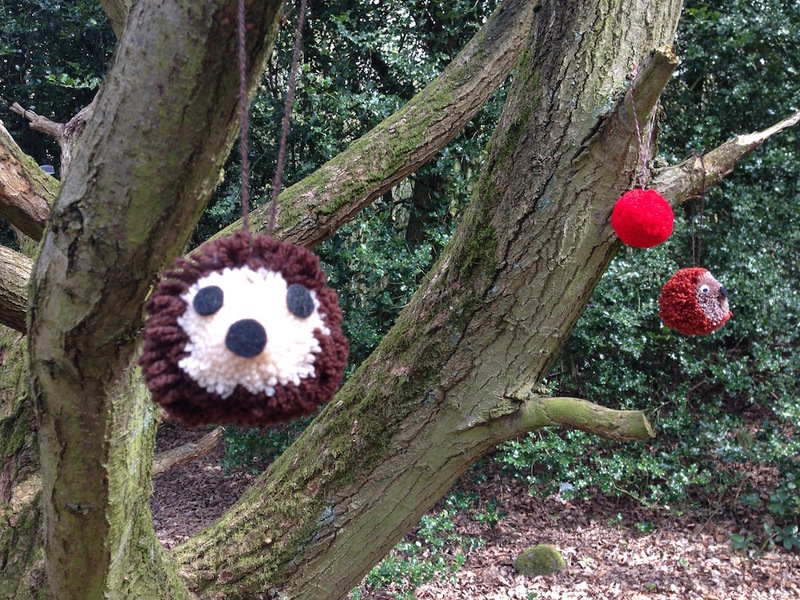 Three years ago we had a tree full of pom pom ladybirds and I had written a blog with instructions on how to make these. 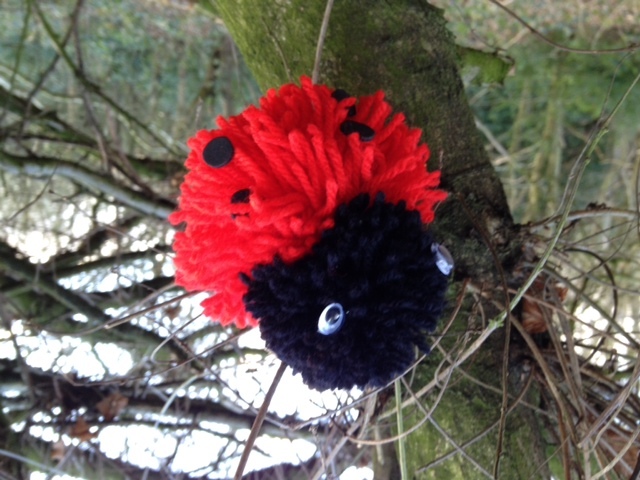 http://www.anneclarkhandmade.co.uk/pom-pom-ladybirds/ In previous years other pom pom animals have been made, including robins, bees and spiders. Here are the instructions for some Hedgehogs It is possible to make things from knitted squares and rectangles which can look really good. 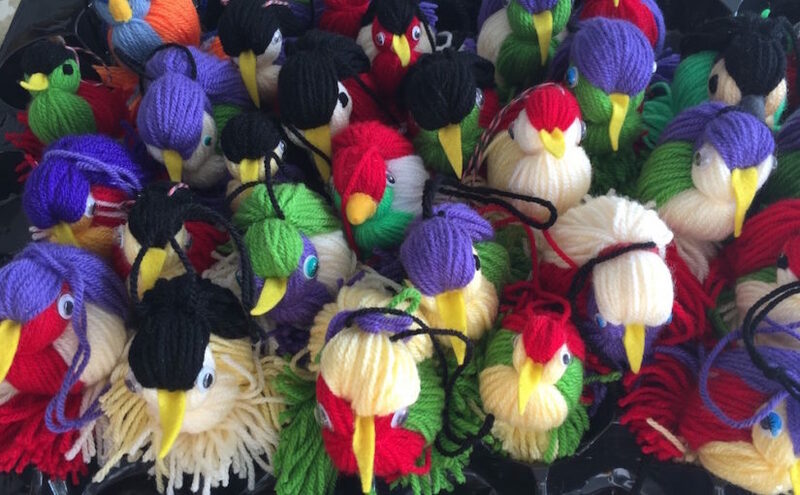 The first I am going to share are knitted birds. 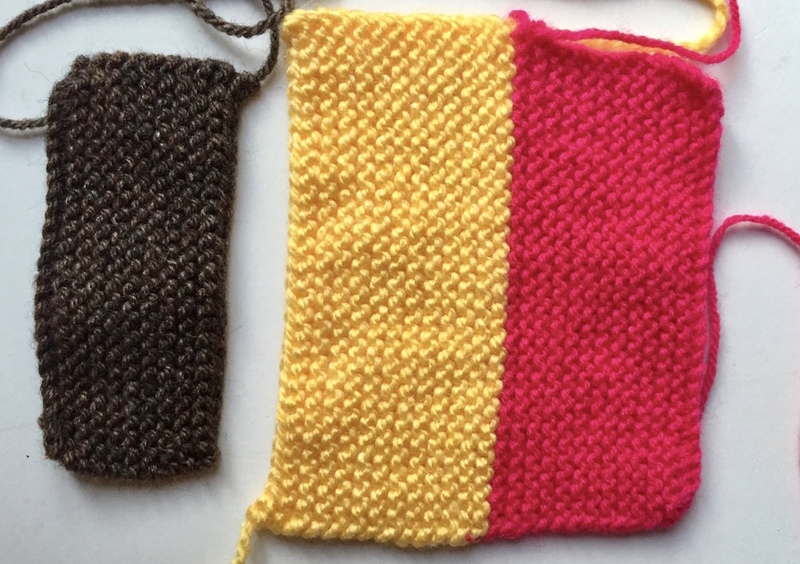 These are made by knitting a square with every row a knit row. For my square I used 30 stitches and knitted 58 rows but this can be varied according to how big the finished bird is going to be. Once knitted the piece is folded in half to make a triangle shape and the open sides are sewn together leaving a gap to stuff the bird. Once stuffed I usually bend one of the more pointed ends forwards to become the head. I put a small stitch in it to keep in place and then sew on two small black buttons for eyes. 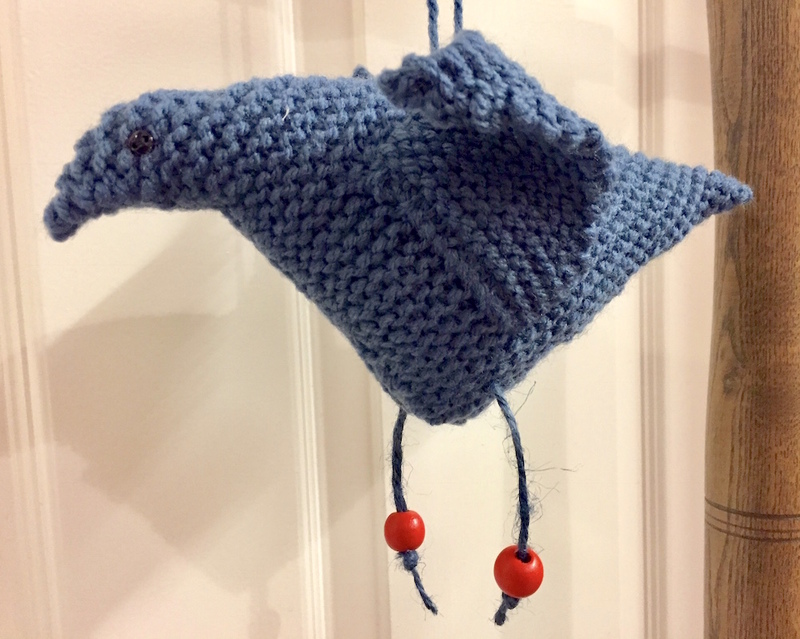 I knitted a couple of wings by casting on 13 stitches and knitting 10 rows. After this I decreased one stitch at the beginning of every right side row by knitting two stitches together. I continued this until the last two stitches could be knitted together and the wing was finished. 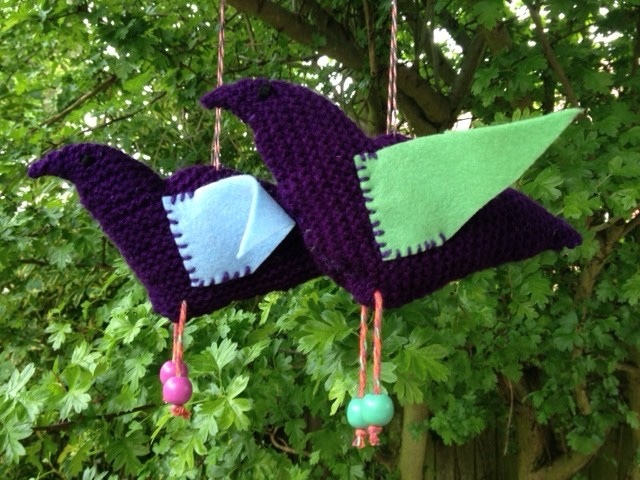 I have also made wings for these birds by cutting out a wing shape from a piece of felt. The legs are made by putting some string or wool through the lower body and stringing beads on the ends. Another creature that can be made from a rectangle of knitting is the caterpillar. 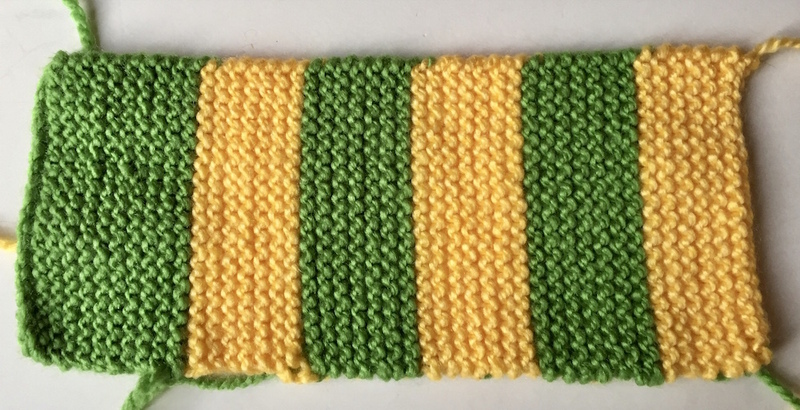 For the green and yellow caterpillar I cast on 20 stitches and then knitted the piece in alternate stripes. 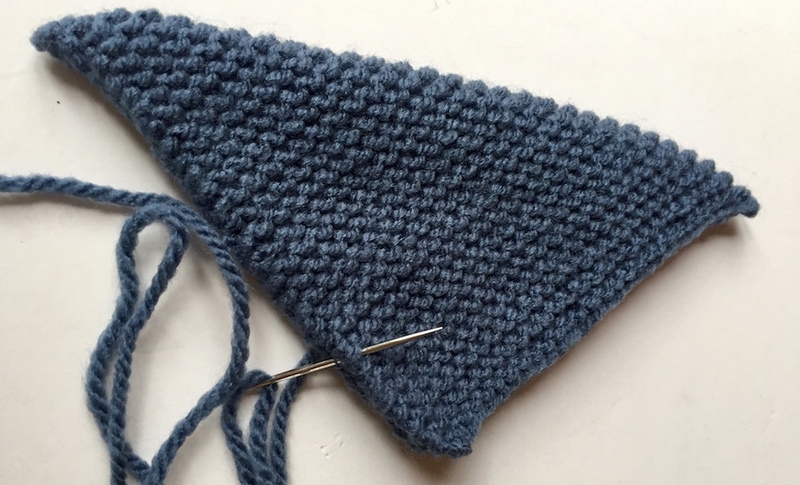 The first stripe had 18 rows and the others had 14 rows each. To make this into a caterpillar I folded it in half and sewed the long edges together matching the stripes. Each end was closed by sewing some running stitches around the short end and pulling it tightly together. I closed one end and then stuffed the caterpillar, once stuffed I finished the other end. To give the piece some more realistic shaping, I sewed some running stitches around each edge of a stripe and pulled up. lastly I used some black yarn to sew some eyes and a mouth. The caterpillar will be attached to a branch making it look as if its back is hunched up. 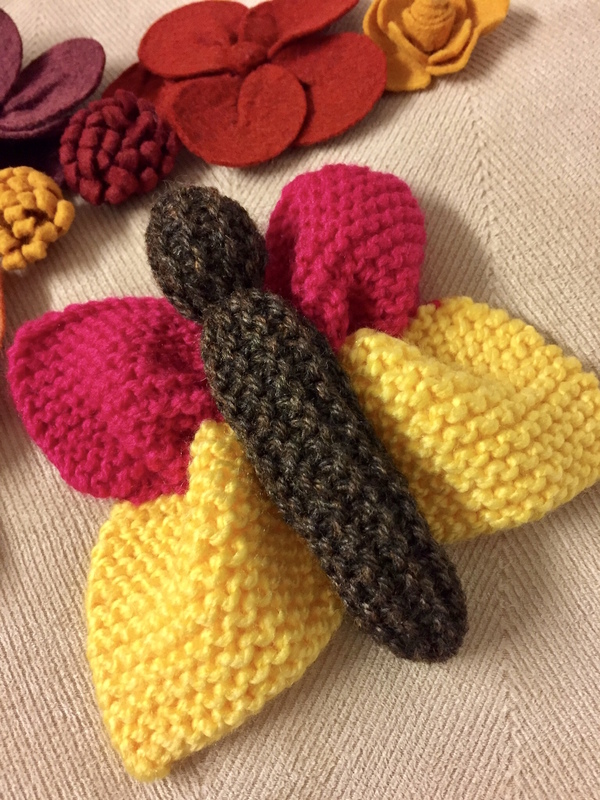 A butterfly can also be made with rectangular pieces of knitting. I made two pieces, the first was in brown for the head and body. 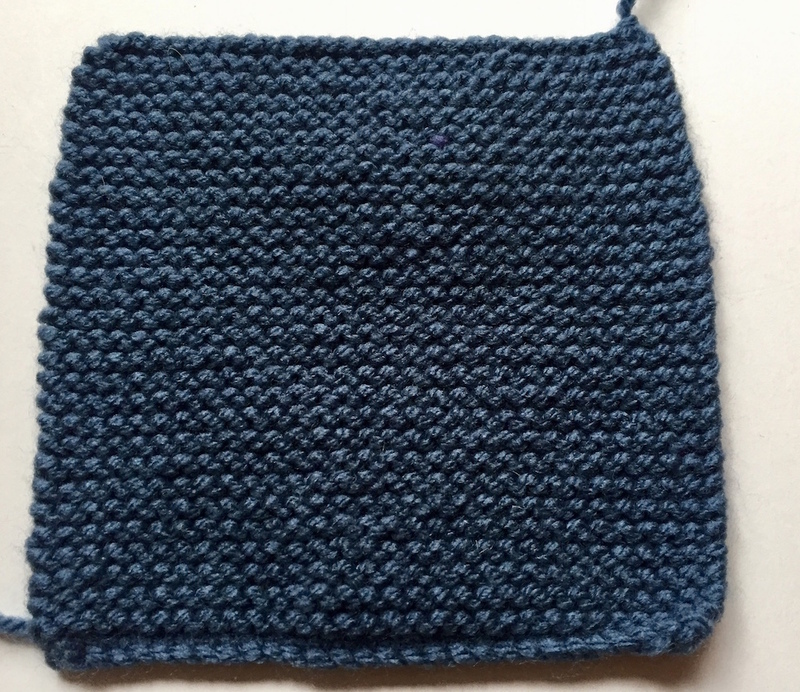 I cast on 25 stitches and knitted 20 rows. The second piece for the wings, I cast on 30 stitches and knitted 46 rows, 24 in yellow and 22 in pink. I made up the body in the same way as the caterpillar and then sewed some running stitches along the middle of the wing piece, sewing a line of stitches along the middle of the yellow and pink stripes. Having pulled these stitches up slightly I joined the wings to the middle of the body. To give the wings more shape, I ran some running stitches along the line where the pink and yellow met and gathered this up. 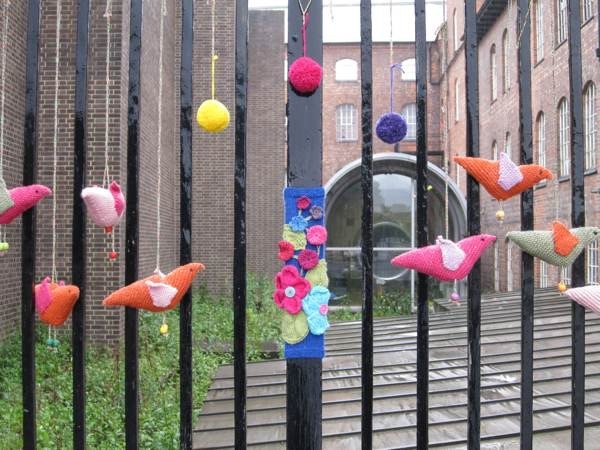 In previous years I have made rabbits from knitted squares with pom pom tales. 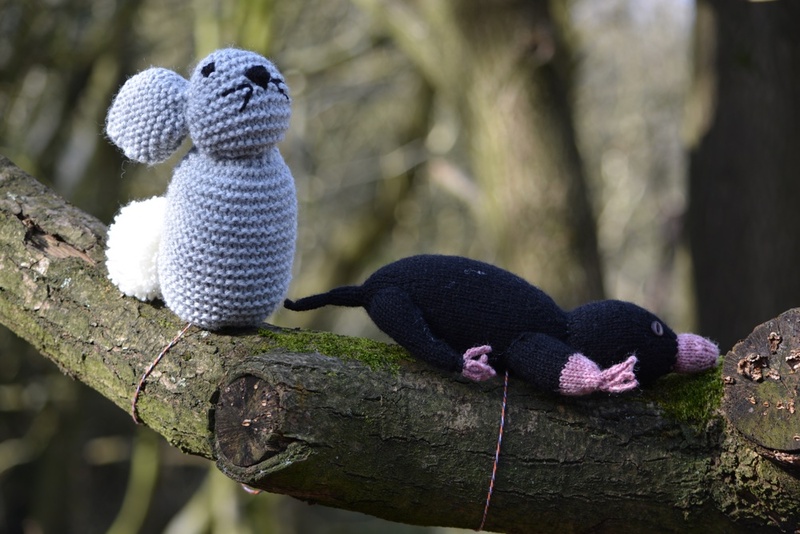 Details of how to make these can be found here Knitted Rabbit. I hope these instructions give people a few ideas and lots feel they would like to become part of Woollen Woods 2018. What wonderful ideas and patterns, must get started soon. Are there any knitting groups I could join ? There are at least two groups and maybe more but so far there is a knitting group that meets every other week in I Should Cocoa on Strutt Street. We meet there between 10.00-12.00 and the next one will be Tuesday January 2nd. The other group meets every Thursday in Creartii on Green Lane again between 10.00-12.00. This will start once kids are back in school. Hi Christine apparently the next group at I Should Cocoa is next Tuesday. I will try and join you. What should I bring ? Everyone just brings along what ever they are making at the moment, we do a little knitting and a lot of chatting. Mine have been too Jan. I am knitting a birds nest with string, very hard on the fingers! Thank you for the ideas in your blog. My friend Christine and I would like to make a ‘Secret Garden ‘ tree which would consist mainly of flowers, leaves, a robin, a key and a partly hidden door. We have got a range of patterns and we are keen to get started. Will there be a meeting which we could attend? I really love this idea, I love the book the Secret Garden. We have not had meetings before but it is a good idea, i will let you know.